to our software and firmware. Only the very latest versions should be available to our customers. XDP, Telemetry Station, and Serial Link devices are supported using the same XDP software installation package. *** ATTENTION!! *** YOU MUST RUN THE XDP SOFTWARE INSTALLER WITH ANY ANTI-VIRUS PROGRAMS DISABLED, AND WHILE IN ADMINISTRATOR MODE! 486 or later processor running Windows 98 or later. 1.5 MB of hard drive space, and 640K of memory. This product works only with XtremeLink® 2.4GHz devices. Not all XtremeLink® devices can have their firmware upgraded. Only 3 channel receivers and Satellite receivers officially support firmware upgrades. However, a large number of our products do have this ability. If your device shows as not having a flashable CPU, then you will not be able to upgrade it. It is not possible to upgrade older non-flashable units to be a flashable type. 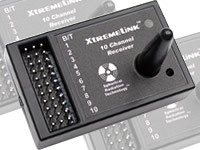 The XtremeLink® Device Programmer (XDP for short) is a USB based device that allows various types of communications with the XtremeLink® product line. The software available here will give you powerful tools for helping you setup your system and diagnose any potential installation or equipment problems. This product is designed for PC computers running Windows 98 through Windows Vista operating systems. Currently, there is not a Macintosh OS version available. The hardware is compatible with USB 1.1 and USB 2.0 configurations. The required cable type is a Type A to Mini-B, which can be purchased directly from XPS. IT IS NECESSARY TO INSTALL THE XTREMELINK® DEVICE PROGRAMMER SOFTWARE BEFORE CONNECTING THE XDP HARDWARE! DO NOT PLUG IN THE XDP UNIT INTO YOUR PC BEFORE THE SOFTWARE IS INSTALLED! To install the XDP software, download the software installer below and run the installer by double-clicking on its icon. Hint: hold the SHIFT key while clicking the link or using the right mouse button when clicking the link and save the file to your desktop so that it is easy to find. Follow the installer instructions to install the software on your computer. Once it has been installed, you can delete the downloaded file. To install the XDP hardware, simply connect the USB cable end with the smaller mini-B connector to the Xtreme Device Programmer, and the other end to your PC's USB port. The first time you do this, you may see a Hardware Installation Wizard appear. Just select NEXT and the driver will automatically found and setup. You MUST have the XDP plugged in BEFORE running any XDP related software. Once the XDP has been plugged in, you can then double-click on any of the icons to run that program. Only one program can use the XDP hardware at a time, so it is necessary to quit one program before launching another. NOTE: If you receive a Windows error message about a missing or non-registered DLL "MSSTDFMT.DLL", then go to our help page by clicking here. All programs compatible with the XDP hardware can also be used with the Telemetry Station. To use the XDP.exe program, you must first put your XtremeLink® receiver or X10+ into a special programming mode. To do this, press and hold the programming button while applying power to your receiver or X10+. There will be a brief pause and then the LED will light up orange (or yellow in the case of the X10+). Release the programming button and you are ready to use the XDP.exe program. To use the XDP.exe program, you must first put your XtremeLink® transmitter module into a special programming mode. To do this, press and hold the PROG button while turning on the power. Keep holding the PROG button and notice the state of the LED. It will turn green, followed by red, and then finally turn orange. Once orange, release the PROG button and the transmitter module is then ready to connect to the XDP.exe program. If the LED does not light up orange, it is likely that you have older firmware that did not have support for the XtremeLink® Device Programmer yet. Xtreme Power Systems would need to upgrade the receiver's firmware to enable this support. 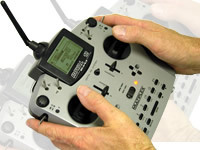 This program acts as a virtual receiver, letting you see the output of your transmitter. The signal strength is also shown. Added ability to monitor the PPM signal and notify you if the pulse jumps unexpectedly. This program acts as a virtual transmitter, letting you control your receiver. This program is a real time 2.4GHz spectrum analyzer. This program shows the RSSI transmitter stength (requires v3.x firmware and hopping modes 2-5). These firmware upgrades REQUIRE a flashable CPU and v3.0 or later firmware to begin with. Updater v3.0 - Receiver v3.9, Nano Receiver v1.7, Satellite v1.4, Transmitter v3.8 - EVO v3.9! ; Changed FS to LF in power up screen. ; Optimized some interrupt code in the LED handling. ; Added saving for RCOUNT in nested interrupts. ; Changed number of available matching groups from 6 to 5.
; Changed match data storage to be flash memory instead of EEPROM. ; Corrected problem with D1 and D2 controls being swapped. ; Changed some error messages to require a response. ; Corrected problem with SBUS2 input. ; Changed LED handling to use DMA instead of bit-banging. ; holding SW2 for 10 seconds at power up. ; Removed JETI UDI support from XBUS Mode B code. ; supports switching between UDI12 and UDI16 on the fly. ; Added ability to reset defaults for a JETI channel map. ; Corrected channel mapping for D1/D2 and E1/E2 with default Futaba channel map. ; Removed 2nd page of Information screen (it was redundant). ; Added option to have LED either OFF or ON when a power-off occurs. ; the power off is not allowed. ; Added support for selecting up to 32 channels. ; Added support for JETI ex-Bus protocol. ; Added auto-repeat for channel number input. ; Re-wrote Spektrum binding routine to delay per Horizon spec. ; Re-wrote Spektrum channel handling per Horizon spec. ; Added support for Spektrum X-Plus channels. ; Added support for Spektrum SRXL protocol. ; Corrected issue with servo pulses being sent for unavailable servo channels. ; Renamed input mode Spektrum to Spek Sat. ; Added support for Spektrum Satellite / SRXL to show channels beyond channel 12.
; receiver is powered up and a RF module failure has occurred. ; Improved re-sync of lost packets with short frames. ; Removed virtual satellite receiver used for testing. ; signal strength and battery voltage. ; Disabled telemetry output when in system is in a failsafe condition. ; are both 900us or more, even with 150% throws. ; Cleared FIFO on startup to prevent possible firmware mismatch warning. ; is less than v3.6! ; Added support for failsafe packet for Graupner telemetry radios. ; Streamlined failsafe capture code. ; for a failsafe of PWM off would be skewed by 66us. ; Added support for binding as a slave receiver. ; receivers can be bound as slaves to 8/10 channel receivers. ; *NOTE: receivers MUST be 12" or more apart when binding! ; Added servo reversing and offset adjustments using the XDP. ; binding port will turn on the LED, also selecting the PPM output mode. ; failsafe monitors as a standard servo pulse is 900us to 2100us. ; slave receiver to be channels 7-12 on outputs 1-6.
; Fixed bug in reboot blinking routine. ; be changed using the XDP. ; Added support for channels 13-16 that were unsupported previously. ; occurs UNTIL the failsafe positions have been defined. WARNING! ; Be extremely careful when setting failsafe for the throttle channel! ; Changed code to put the version number at the end of FLASH memory. ; Added reboot warning flag bit to Xtreme mode output flags. ; Changed reboot warning flag bit assignment. ; Fixed channel mapping for PPM mode. ; Added support for telemetry data. The receiver will return RSSI. ; Corrected issue with short fixed frames (EVO). ; Put back check for S.BUS header byte. ; Fixed problem with R7008SB receivers. ; Changed channel output to be port based instead of channel based. ; adapter in the Aux port. ; with the long frame rates (Taranis). ; prior to getting first valid packet. ; Dramatically improved dual Rx support for Xtreme protocol. ; Added support for DMSS X-BUS Mode A and Mode B protocols. ; Fixed issue with SBUS2 variable lenth frames. ; Added support for Graupner/SJ HoTT SUMD protocol. ; because they use the proper baud rate. ; Added support for automatically recognizing Spektrum DSMX frames. ; Put SBUS threshold limit to a minimum of 880us (lowest possible). ; condition after a failsafe channel was set to 'OFF'. ; v1.1 - 05/11/18 - Added support for JETI UDI12 and UDI16 protocols. ; SRLX code (also used with JETI UDI). ; Changed timer 1 to use 16 bit mode. ; Fixed issue with frame rates > 32.768ms. ; etc. will see the RFU like the original 8/10 channel receivers. ; Corrected some issues with long fixed frames (EVO). ; Fixed voltage for telemetry output. ; Enabled the DivBee's PA for telemetry data. ; Initial test version for 16 channel receiver. ; Changed hardware to LDO regulator version. ; Changed LED and telemetry port input and output pins. ; passed to the main receiver when there is a complete loss of data. ; Fixed bug with learning multiple satellite receivers. ; Improved hopping re-synchronization after long loss of signal. ; Removed LED blinking debug mode. ; compensate for receivers that used the old (slower) data rates. ; Added support for new flashing setup. ; Made lock command ignore all other 802.15.4 devices on startup. ; the power when no receiver is connected (hopping modes 2-5). ; in supporting PCM intput. ; instead. This keeps the hopping fully synchronized. ; provides the Rx voltage and RSSI information. ; power (dead transmitter batteries or loose module pins). ; Removed XBEE reset routine as it is no longer necessary. ; v3.9 - 06/24/11 - EVO ONLY! ; from our module's telemetry interface. ; issue with variable frame rates (Taranis issues). ; Added support for XJT D16 mode. ; modules is PPM/XJT selection. 1 flash = PPM, 2 flashes = XJT. ; a certain value (fix for 'tick' issue)? ; Re-wrote XJT capture code to handle v2.1.0 and later OpenTx firmware. Fixed problem with config not saving language types other than English. copying the language file to the Data folder. class, output type, and output format bytes. Capped telemetry packets to 80 bytes. Added support for MCxx and MX-24 radios. Added support for GPS sensors. Added more output types to handle more sensor types. Added icon for telemetry window. the sensor is not responding for any sensors that are not attached. Added support for Turbine EDT sensor. Added support for newer hardware revs. Fixed problem with Value and Class output for telemetry display. file. Removed firmware update capabilities. allows the selection only if using the Telemetry Station. can be changed for channels not available as receiver outputs. Added all Nano and Pico receiver device support. Fixed problem with windows not showing up in the task bar. Added support for Nano-T, Nano-E, and Pico receivers. Added support selecting a telemetry output (PC only or TX/PC). Changed copyright to include 2010.